So, tell me who is surprised that John Groce's Fighting Illini men's basketball team is 12-1 through their first 13 games? When the schedule came out and judging by what we knew of this team going into the season, there was little hope that the Illini would storm out of the gate with this level of success with the likes of Gonzaga, Missouri, and the Maui Invitational on the docket. 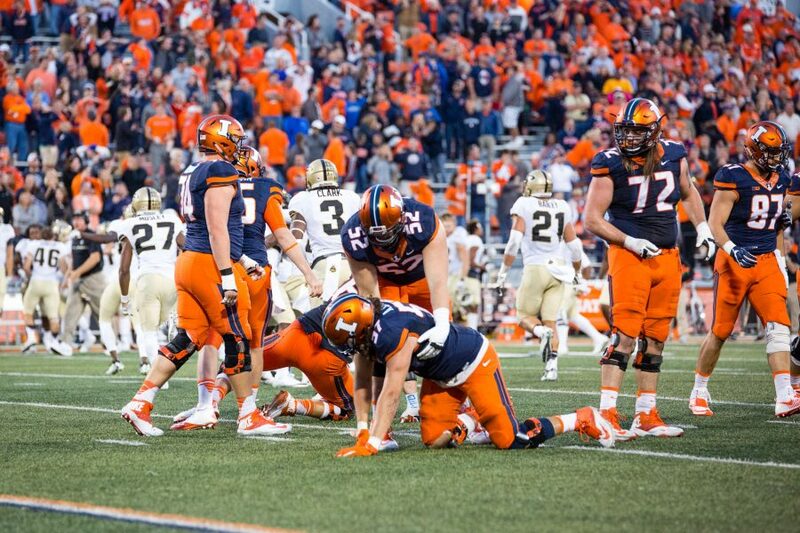 But, with the exception of the loss to Missouri last week in St. Louis, the Illini are defying odds and showing the country that they are for real. Before the Missouri game, people wondered if the Illini were still worthy of the Top 10 ranking that they were carrying around with them, and even though they were defeated by the Tigers, they showed great resolve and made the game close throughout the contest. This leaves one game remaining in the non-conference schedule, the annual United Center tilt with Auburn on Saturday (1:15 pm CT, BTN). On paper, this points to yet another win, but the UC floor has not been kind to the Illini the last couple of times out, including the very ugly loss to UIC a couple years back. Once the game with Auburn is done, it will be time for the Big Ten season to begin, and this will be one of the deepest leagues in recent memory, as Indiana, Michigan and Ohio State all join the Illini in the top 15 in the nation. Better enjoy the ride while it is smooth, guys. The Fighting Illini women's basketball team has been holding their own so far this season under new coach Matt Bollant, but nobody said it would be easy for them to have sustained success, even though Bollant came in with a strong pedigree of coaching. The Illini dropped a tough game last Friday night at the Assembly Hall 69-68 to Illinois State, a game that they seemingly had in control until the bottom fell out. Karisma Penn had another monster game for the Illini, as she scored 22 points, grabbed 15 rebounds, and had 6 blocks in the defeat. Alexis Smith had a chance to win the game for Illinois, but her three-pointer bounced off the rim as time expired, giving the Redbirds the hard-fought victory. The Illini have a another tough game ahead of them, as #6 Georgia invades the Assembly Hall on Friday night (7:00 pm, CT, No TV). The Bulldogs come into the game with the Illini a perfect 12-0 on the season. Had a chance to take in some of the Pontiac Holiday Tournament and see a couple future Illini players in Kendrick Nunn and Jaylon Tate. For a small town, there is sure some big time basketball being played in Pontiac over the course of 3 days to end the year. The headliner of the tournament is Simeon High School, who have the two Illini recruits Nunn and Tate, plus perhaps the crown jewel of the 2013 season in Jabari Parker, who last week announced that he would be attending Duke University to play basketball. Illinois was never really a factor for Parker, although rumor has it if Bruce Weber would have stayed at Illinois, the situation may have been different. Parker narrowed his final choices down to 5, and the Illini were nowhere on that list. Nunn and Tate, on the other hand, will renew the tradition of wearing the #25 in honor of Ben Wilson, a Simeon player that was gunned down during his senior season back in 1984. It appears that Nunn will wear the #25 jersey. Another top prospect in the nation also played in the tournament, Cliff Alexander of Chicago Curie. Alexander, one of the top 4 prospects in the class of 2014, has received offers from virtually every top tier program in the nation, including Illinois. However, he seems to be leaning toward Michigan State, although he has not made a commitment one way or the other for the time being. So far in the John Groce era at Illinois, things have gone very well, and the sudden resurgence of the basketball program has made a lot of people around Illini Nation forget the disaster that the football season provided. Going into last Saturday evening's game at Gonzaga, nobody (including this pundit), gave the Illini a fighting chance to walk into Spokane and knock off the Zags. But, that's exactly what happened, as Illinois survived a cold start that saw them get down by double digits early in the game to upset Gonzaga 85-74 to move to 10-0 on the season. Brandon Paul was 'da man, as he scored 35 points, giving people flashback memories to last season, when he dropped 42 on Ohio State. Paul seems to be coming into his own and taking a leadership role on this team, something that was severely lacking last season under then coach Bruce Weber. But, this is a different attitude altogether for the new-look Illini, and it shows on the court. The next question was, how would the Illini respond in their next game, a seemingly winnable game against Norfolk State? The answer was somewhat expected, as they struggled on Tuesday night at the Assembly Hall against the Spartans, but still came out on top to defeat Norfolk State 64-54 to extend their winning streak to begin the Groce era to 11. Paul once again led the Illini in scoring with 14 points, while D. J. Richardson, who was banged up during the game, added 11. The fast start for Illinois is renewing expectations for a return to the NCAA Tournament, but not so fast, folks. The Big Ten, which is the strongest it has been in a long time, still beckons. But, one game at a time. The next challenge for the Illini will be unbeaten Eastern Kentucky on Sunday at the Assembly Hall (5:00 pm CT, ESPNU). The Colonels are 9-0 and have beaten Norfolk State by a larger margin than what the Illini did. They also have a local product on their team in former Centennial Charger Jeff Johnson. Johnson, who has transformed his body by losing about 45 pounds in the off-season, may not be the most prolific player on the Eastern Kentucky roster, but he is making a difference and playing Division I basketball, which is no small accomplishment itself. Johnson is also the former teammate of Illini player Ravonte Rice, who is sitting out this season due to transfer rules. The Illini tend to play down to the level of their opponent, and this is no exception to that rule. One game at a time boys, one game at a time. Groce also received some good news on the recruiting front this past week, when he locked up his first verbal for the 2014 recruiting class. Centennial product Michael Finke, who has been wooed by several other schools in the Big Ten, decided he wanted to stay home to play his college basketball. Finke, a junior, has really elevated his game in the past season, and according to him, the sky's the limit as to how far he can further improve his game. Finke also stated that he models his game after current Illini player Tyler Griffey, and can see himself in the role in Groce's offense. The 2014 class is off to a good start, no doubt. The Big 10? How much is enough? Last week, the Big Ten announced that two more schools, Maryland and Rutgers, would be joining the conference in the summer of 2014. With the added expansion east, that brings the total number of schools to 14 if you're scoring at home (and I know you are, admit it). This brings a number of questions to the forefront, mainly where is the endpoint for expansion? It is evident that these schools are being brought in for one reason, and that is exposure to television markets in the New York and Washington D.C. areas, and the underlying factor in all of that is obviously money. Commissioner Jim Delany has done a remarkable job in getting the Big Ten the needed attention in markets dominated by the Big East and ACC conferences, but what does it do for the sports that those teams play? Rutgers has been successful on the football field, but you really don't think of them as a powerhouse in basketball. The opposite applies to Maryland, who has been relevant in basketball, but sporadic in football. This will ultimately create very long conference road trips, with the league stretching from College Park, Maryland to Lincoln, Nebraska. What will end up happening as these schools and conferences play the proverbial game of 52 card pickup is there will be 4 major conferences, with 16 teams per conference. Have at it, NCAA! It's your mess, now fix it! The John Groce era at Illinois is off to a great start, and Groce now owns the best beginning to an Illinois coaching career since Fletcher Lane, over 100 years ago. For his early heroics, the Illini have returned to the national rankings, and find themselves #13 in the AP poll and #14 in the ESPN/USA Today Coaches poll in this week's poll. Many pundits say that this is too high a ranking for the Illini, and they may be right. I am not sure what they are basing this on, but after all, they are 9-0 and have a Maui Invitational championship to their credit. However, they have struggled with teams that they should beat handily, and Tuesday night's contest against Western Carolina is a prime example of this. The Illini won the game 72-64, but it was far from the game that it should have been. This Illini team does have a bit more resolve than the one coached by Bruce Weber last season, and there are already marked differences in Groce's coaching style with these guys. The Illini will get a stern test on Saturday evening when they travel to Spokane, Washington to take on the Bulldogs (or do you say Zags?) of Gonzaga (9:00 pm CT, ESPN2). Gonzaga is also 9-0 on the season, and ranked #10 in the country, and the Illini are finishing up a four game series with the Bulldogs dating back to 2009. The Illini have won the last two games in the series, last season in Champaign (82-75) and in 2010 in Seattle (73-61), but this Gonzaga team is big and veteran, and nobody expects the Illini to go into the Zags' arena and come out with a victory. However, if they do, then maybe that ranking doesn't look so bad after all. One funny bit from the game the other night regarding Groce. In his postgame press conference, he remarked that he was glad that he wore dark underwear, because one time when he crouched, he split his pants, and remained that way for the rest of the game. Side-spliting, or in this case, seam-splitting, indeed. New Illini women's coach Matt Bollant knew that transforming this team into an instant winner would be a challenge, and so far, he has been right. The Illini have been fun to watch and competitive in their games, but only have a 4-4 record to show for it thus far. The Illini dropped a 75-56 contest to Texas Tech in Lubbock on Wednesday night, behind 21 points by Amber Moore and 18 for Karisma Penn. The Lady Red Raiders came into the game at 6-1 overall, so winning on the road was a tough task to begin with. The Illini will conclude their brief 2 game road trip on Sunday when they travel to Memphis, Tennessee to take on Memphis (2:00 pm CT, No TV).